At HITN Learning we are committed to the social, emotional, and academic success of Hispanic/Latino children ages 0-14. Our mission is to provide parents, caregivers, and teachers with original learning media products, in English and Spanish, which engage Hispanic families on their education journey. We serve learners from all cultural backgrounds who value the bilingual English-Spanish experience. As recipient of a $30 million Ready to Learn grant (2010–2016) from the U.S. Department of Education, HITN served as the lead partner of the Early Learning Collaborative/ELC to design and distribute transmedia learning resources to promote school readiness for preschool children. 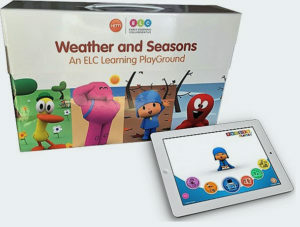 Pocoyo PlayGrounds (kits) and Pocoyo Playsets (apps) employed an engaging transmedia approach to learning. Kits and apps were deployed at Head Start centers, public and private schools, day care centers and special education facilities in 11 states, D.C., and Puerto Rico. The grant-funded ELC resource array became the inspiration for Cleo & Cuquin Family Fun! There are 21 units focused on Early Literacy, ELL (English Language Learners), and Early Mathematics, designed and developed by HITN as part of ELC. 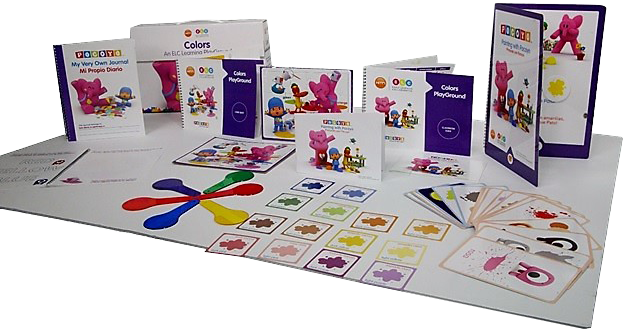 The package includes 15 Pocoyo Playset digital applications and non-digital materials, such as vocabulary cards, storybooks, rugs, desktop puzzles, magazines, and manipulatives. In a randomized controlled trial study of Spanish-speaking preschool-aged children by the Michael Cohen Group, the Pocoyo Playsets were found to be significantly more effective in promoting improved English language skills than similar commercially available apps. Further, MCG also determined that this improvement increased for children with the weakest English language skills. This result, after studying more than 600 children in four states, was affirmed through case studies and surveys of ELC pilot sites in 200 classrooms from California to Maine to Puerto Rico.